Egypt has long been a destination and transit country for refugees, asylum seekers, and migrants from across the Middle East and Africa. Its Mediterranean coast has served as an important staging point for people attempting to reach Europe irregularly. Observers have repeatedly expressed concerns about Egypt’s use of police stations and prisons for immigration detention purposes. Despite on-going government repression of civil society organisations and the dire conditions migrants face in detention, Egypt remains a key EU partner in Mediterranean migration control policies. Its repeated crackdowns on irregular flows along its borders have led to higher rates of detentions and deportations. Since July 2013, the jurisdiction of Egypt’s military has further expanded and military officers may arrest non-citizens for immigration reasons, placing them before military tribunals that do not meet international fair trial standards. Detention facilities—which include police stations, border guard stations, and prisons—are often overcrowded and lack basic detention conditions. There is no maximum length of administrative detention in Egyptian law and the Egyptian government does not release statistics related to the actual or average time-limit for administrative detention. Although UNHCR is authorised to conduct Refugee Status Determination based on a 1954 MoU with Egyptian authorities, representatives have often been denied access to detention facilities, as well as to refugees and asylum seekers. 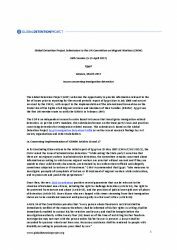 Despite recommendations from the UN Committee on the Rights of the Child, children continue to be regularly placed in immigration detention. UNHCR estimates that there are more than 3,800 unaccompanied (or separated) children of concern in the country. Despite ongoing human rights abuses in Egypt, the European Union has intensified EU-Egyptian cooperation in “migration management,” leading to a comprehensive crackdown on irregular migration on Egypt’s north coast. Egypt has long been a destination and transit country for large numbers of refugees, asylum seekers, and migrants from across Africa and the Middle East. There are approximately 230,000 refugees and asylum seekers from 58 countries registered with UNHCR in Egypt—including, notably, some 130,000 Syrians, 40,000 Sudanese, 15,000 Ethiopians, and 14,000 Eritreans, and increasing numbers of Yemenis. Observers have also repeatedly highlighted the large numbers of unregistered asylum seekers and migrants (including an enormous population of Sudanese, who are estimated to number anywhere between one and five million). Egypt is also an important country of emigration. According to official statistics, some 9.5 million Egyptian nationals were living abroad as of 2017. Egypt has witnessed consecutive migratory developments on its borders, linking the country to wars, crises, and displacements across the Horn of Africa and the Arab world. Previously, Egypt was a transit point for people attempting to reach Israel via the Sinai Peninsula; these numbers significantly decreased following Israeli government securitisation policies and Egyptian army operations against jihadist groups in North Sinai. Starting in 2013, refugees from Syria pioneered irregular departures from Egypt's north coast. Egypt also remains an important transit country for people trying to reach Libya and beyond. As the numbers of Syrian refugees attempting to irregularly migrate to Europe via Egypt's north coast began to grow, so did detention rates. In addition, since 2015, intensified Egyptian-EU "migration management" cooperation has lead to a widespread crackdown on irregular migration on Egypt's north coast, as well as around the country generally. During the first 8 months of 2016, Egyptian authorities detained 4,600 refugees, asylum seekers, and migrants—a 28 percent increase on the 2015 total. Egyptian criminal law provides grounds for prosecuting people for status-related violations. Previously, sources in Egypt reported to the Global Detention Project (GDP) that authorities frequently charged people for migration-related infractions. However, more recently observers report that authorities generally avoid criminal prosecution, instead holding migrants in detention through administrative orders from the Department of Passports, Immigration and Nationality. A landmark 2016 counter-smuggling law, which criminalised people smuggling (as opposed to human trafficking) for the first time in Egyptian law, legally defines irregular migrants as "victims." However, it has failed to stop the administrative detention of irregular migrants charged with irregular entry, stay or exit. Rights groups have repeatedly criticised the country for arbitrarily detaining non-citizens and using military tribunals to try them. Refugees and asylum seekers registered with UNHCR in Egypt are often released after a matter of weeks. Non-registered people of concern are vulnerable to extended periods of administrative detention. Against the backdrop of the Egyptian government’s harsh crackdowns against civil society as well as ongoing political turmoil in the Middle East, refugees, asylum seekers, and migrants in Egypt remain subject to numerous abuses and face enormous challenges regarding their futures. For example, there have been reports of Egyptian soldiers firing on smuggling vessels heading for Europe. Since 2015 in particular, intensified Egyptian-EU "migration management" cooperation has lead to a comprehensive crackdown on irregular migration on Egypt's north coast in particular, as well as around the country more generally. Human rights defenders and local NGO sources maintain that the northern sea route towards Europe has become a “dead-end,” accompanied by significant increases in arrests, detentions, and deportations. 2.1 Key norms. Legal provisions relevant to immigration-related detention in Egypt are contained in various legal instruments, including the 2014 Egyptian Constitution, the 1960 Law on Entry and Residence of Aliens in the Territories of the United Arabic Republic and their Departure Therefrom (Law No. 89 for the year 1960 as amended by Law No. 88 for the year 2005), and the Criminal Code, as well as various presidential decrees like the 1995 Presidential Decree on Security of the Eastern Border of the Arab Republic of Egypt. Application of the law can vary considerably from case to case, depending on where a person is detained, the nationality of the detainee, and the detaining authority in a particular case. The main function of administrative detention is to enforce the removal of non-citizens. According to Article 27 of the Law of Entry and Residence, authorities can keep non-citizens in detention after they complete criminal sentences and until they are deported. The interior minister has the authority to deport non-citizens and can order temporary detention until deportation is possible. A foreign national can be issued with an order of deportation by the director of the Department of Passports, Immigration and Nationality if they enter Egypt by “illegal methods”; fail to obtain a residence permit following the expiry of an entry visa; violate the “purpose” for which they obtained residency; fail to depart from the country within 15 days from the expiry date of the residence period, unless a request for renewal has been approved prior to the expiry of the original residence period; or fail to depart from the country within 15 days from the date of being notified of the refusal to grant residency or renewal of residency (Law of Entry and Residence, Article 31). “Aliens” who represent “a threat to the State and country security and safety, internally or abroad, or to its national economy, public health, public moral, or public tranquility, or [who is] a burden on the state” can be issued with a deportation order (Article 26). Article 23 of the Law of Entry and Residence also provides that non-citizens who “contravene” without permission the original purpose for which they were authorised to enter or reside in Egypt may be banished from the country (as well as facing fines of up to 2,000 EGP [approximately 112 USD]) (Article 42). Deported persons are prohibited from re-entering the country unless granted permission to do so by the Minister of Interior (Law of Entry and Residence, Article 31). Non-citizens found to violate this article can be subject to imprisonment for a minimum of one year (Article 39), although this is not routinely applied. Meanwhile, the Law of Entry and Residence (Article 16) requires that non-citizens residing in Egypt obtain a residency permit and depart form the country upon termination of residence. 2.3 Asylum seekers. Egypt is party to the 1951 UN Refugee Convention and its Protocol, with reservations in relation to personal status, rationing, and public relief and education. It is also a signatory to the African Union Convention Governing the Specific Aspects of Refugee Problems in Africa. Article 91 of the country's 2014 Constitution provides that political asylum must be available to anyone who has been persecuted for defending human rights, peace, or justice. Despite these provisions, national determination procedures have not yet been developed for the recognition of refugees. In addition, Egyptian law does not provide protection for stateless persons, and Egypt is not a party to either of the 1954 or 1961 statelessness conventions. While asylum seekers have the right to legal representation, source sin Egypt told the GPD that there is a lack of timely access to asylum procedures and international protection as registration waiting periods with UNHCR average between 4 and 5 months, leaving asylum seekers vulnerable to administrative detention and deportation. According to UNHCR, detention of those moving irregularly, including refugees and asylum seekers, has increased year on year, particularly since 2013. Moreover, the country has been heavily criticised for forcibly returning migrants and asylum seekers to places where they could be subject to persecution and possibly torture. The forced return of Eritreans in particular has been a long-standing problem in Egypt, although Sudanese asylum seekers and migrants appear to be increasingly vulnerable. According to Amnesty International, the country deported at least 50 asylum seekers—including two young children—from Eritrea, Ethiopia, and Sudan between January and April 2017. UNHCR’s Cairo office has the authority to conduct Refugee Status Determination based on a 1954 Memorandum of Understanding (MoU) with Egyptian authorities. Despite this MoU, UNHCR representatives have often been denied access to detention facilities, refugees, and asylum seekers, or have had their access restricted to those refugees or asylum seekers already registered with the UNHCR prior to their arrest, or on a case by case basis. One observer previously claimed that this can “prevent victims of trafficking and/or smuggling from coming forward to report their situations.” UNHCR in Cairo has requested access to a number of persons in detention, including potentially stateless persons, without success. In some cases, individuals who were found to be non-deportable were released with a six-month laissez-passer document. However, sources in Egypt have also told the GDP of cases of extremely long detention periods of people of concern to UNHCR. One on-going case involves a stateless woman detained since 2014 with a baby she gave birth to in detention. She has remained in detention despite having serious mental health problems. The sea route from Egypt's north coast was expanded with the arrival of refugees from Syria after 2013. Egypt, under the rule of the Muslim Brotherhood’s Muhammad Morsi until mid-2013, initially applied an open-door policy regarding those fleeing the conflict in Syria. Shortly after Morsi's ouster however, authorities adopted increasingly strict policies. In July 2014, the government imposed measures requiring Syrian nationals to apply for a pre-arrival visa and security check through the Egyptian embassy in Damascus. This significantly decreased the number of Syrian nationals arriving in Egypt—reportedly, 476 Syrians were deported or denied access to Egyptian territory that same month. Although the Egyptian government previously estimated that there were approximately 250,000 to 300,000 Syrians residing in Egypt in mid-2013, officials often claim there are significantly more Syrian refugees residing in the country. In August 2016, a Foreign Ministry official claimed—without evidence—that there were 500,000 Syrians residing in Egypt. Approximately 1,500 refugees from Syria, including at least 400 Palestinian refugees and 250 children, were detained during the second half of 2013, according to Human Rights Watch. Up to 1,200 of these detainees were sent to Turkey, Lebanon, or Syria (where they potentially faced arrest and torture). The government denied that Syrian refugees were forced to leave, instead claiming that, "No Syrian refugee is made to depart from Egypt unless they have been proven to have entered the country through illegal immigration, an action contrary to Egyptian law.” Since 2015, Syrians have generally stopped irregularly migrating via Egypt's north coast. 2.4 Children. Egypt detains children in immigration detention facilities, and NGOs, activists, and other sources have repeatedly documented the detention of minors in Egyptian police stations and prisons. In 2011, the UN Committee on the Rights of the Child recommended that Egypt should not detain asylum-seeking children and should ensure unimpeded access to any detained asylum-seeking child by UNHCR. UNHCR has also noted an increase in the numbers of unaccompanied or separated children irregularly crossing Egypt's southern border with Sudan. The agency counts more than 3,800 unaccompanied (or separated) children of concern in Egypt. 2.5 Other vulnerable groups. The complex nature of mixed migration flows to, via, and from Egypt raises concerns about the rights of vulnerable groups—including victims of trafficking and stateless persons—in immigration detention. The trafficking of foreign nationals across Egypt has been a major concern for many years. In 2010, the country adopted Law 64 on Combating Trafficking in Persons, Article 21 of which provides that victims of trafficking cannot be held criminally responsible for trafficking-related violations. Some experts have noted that the law has inconsistencies. For instance, one lawyer wrote that while Article 22 stipulates that victims of trafficking who do not hold “permanent residence permits” in Egypt shall be returned to their country safely and swiftly, there is no such thing as a “permanent residence permit” in Egypt. A major trafficking route through Egypt emerged in the late 2000s at a time when refugees, asylum seekers, and migrants from the Horn of Africa were transiting via Egypt en route to Israel. According to one study, between 2007 and 2013, up to 30,000 persons were trafficked in the Sinai, of whom between 5,000 and 10,000 died as a consequence of brutal trafficking practices in North Sinai where trafficking victims were tortured for ransom money. Many victims of trafficking were held in harsh conditions by Bedouin tribes. If they managed to escape, victims of trafficking were sometimes subjected to detention for up to three years under a law adopted by Israel, or detained for long periods in Egyptian jails or military camps. According to unofficial estimates, thousands of victims of trafficking in Egypt have disappeared in recent years, many of whom were later found confined in Egyptian jails. There have also been allegations of the police working with traffickers. In one case, trafficking victims reported that a group of hostages from Ethiopia and Eritrea were able to subdue their traffickers and bring them to a police station in southern Sinai. The police, however, allegedly set the traffickers free and put the migrants in prison. During military operations in the Sinai that began in June 2013, the Egyptian army reportedly raided “torture houses” used by traffickers to hold—and torture—people as they waited for ransoms to be paid. Some of the houses had rooms that featured “hooks on the ceilings from which the kidnapped are hung as they are beaten.” Many of the people rescued by the military from these houses were subsequently placed in detention and charged with “illegal entry” into Egypt. Numerous observers contend that Egyptian authorities make no attempt to identify trafficking victims among migrants transiting the Sinai and do not investigate allegations of collusion between security forces and traffickers. The industrial-scale trafficking that existed between the Horn of Africa and North Sinai has mostly ended as a result of the ongoing military operations by the Egyptian army against jihadist groups in the area, most notably an Islamic State wilaya (province) based in North Sinai. Stateless persons remain vulnerable in Egypt, partly because Egypt has not signed either the 1954 Convention relating to the Status of Stateless Persons or 1961 Convention on the Reduction of Statelessness. Egyptian law does not provide protection for stateless persons although, in some cases, stateless persons in detention who were found to be non-deportable were simply released with a six-month laissez-passer document. Palestinian refugees in Egypt (displaced from the Occupied Palestinian Territories either during 1948, 1967, or since) have been “marginalised” and “reduced…to the status of foreigners [while] denied access to international bodies able to voice their needs.” Significantly, they also encounter protection gaps in Egypt because the government does not allow UNHCR to provide them with protection and assistance (as they should to Palestinian refugees outside the UN Relief and Works Agency for Palestinian Refugees' (UNRWA) five areas of operation, according to UNHCR's authoritative interpretation of Article 1[D] of the Refugee Convention) but simultaneously does not allow UNRWA to operate in Egypt either. Most recently, that status quo has impacted thousands of Palestinian refugees from Syria (PRS) either displaced to Egypt, or transiting through Egypt en route to Europe. PRS have been arbitrarily detained, deported and, in some cases, refouled (to Syria). Meanwhile, both UNHCR and UNRWA are unable to adequately protect or assist them because of the 'protection gap' between their mandates. In a landmark case in 2015, at least 70 PRS were resettled to three European countries from Karmouz Police Station in Alexandria—although not before a months-long stand-off between the Egyptian government, European embassies and UNHCR (partly because the Egyptian government and European embassies were concerned about setting a precedent by which refugees and asylum seekers might see detention as a sure-fire route to resettlement). A so-called "shoot-to-stop" policy was also employed by Egyptian authorities in the Sinai—introduced in 2007 after intense pressure from Israel to halt the smuggling of migrants across the Sinai border. Similarly, non-citizens attempting to cross Egypt's western border with Libya encounter an intensified military presence there on account of ongoing instability in Libya as well as the presence of jihadist groups that have previously launched attacks on Egyptian security forces from across the border. This can significantly heighten the risks and potential rights abuses faced by refugees, asylum seekers, and migrants attempting to reach Libya via Egypt. According to information provided to the Global Detention Project, undocumented migrants generally no longer serve criminal prison sentences for violations related to entry or stay. However, there have been cases in the past in which foreign nationals apprehended at the Sudanese border and convicted of illegal entry have spent several years in prison, often being transferred from prison to prison as they shift between criminal and administrative procedures. In one case, a group of foreign nationals apprehended at that border were initially detained at a police station in southern Egypt. After completing a one-year prison sentence for illegal entry at Alexandria's Borg El-Arab Prison, they were confined for an additional three months at the same police station where they were initially detained because they were unable to pay the fine for illegal entry. After this three-month period, the migrants were transferred to the men’s section of Qanater Prison, registered with an immigration status and then kept in detention for an additional period of time, until deportation. 2.7 Procedural guarantees. The Law of Entry and Residence does not contain any provisions guaranteeing rights to detained migrants, such as access to a lawyer. Refugees, asylum seekers, and migrants arrested for illegal entry at non-authorised border points fall within the jurisdiction of the nearest military tribunal and have no access to appeal, a practice that has been criticised as a violation of Egypt’s obligations under the International Covenant on Civil and Political Rights (Article 14) and the Arab Charter on Human Rights providing for due process and a fair trial (Article 26). Irregular migrants and refugees are sometimes given an appeal in court, though this appears to occur on an ad hoc basis. According to Egyptian law, defendants in criminal cases have a right to access legal counsel. Article 96 of the 2014 Constitution establishes that the accused is innocent until proven guilty in a court of law and provides guarantees for legal defence. Additionally, the Criminal Code (Law 214) establishes that the General Attorney nominate a lawyer for any individual accused of a criminal offence. However, this provision is reportedly generally not enforced in cases involving allegations of illegal entry or presence in the country. Individuals arrested are first referred to a general or military prosecutor (according to the area of arrest), who then refers the case to a court (civil or military), where the accused is typically unable to exercise his/her right to a defence as no lawyer is provided. The Code of Criminal Procedure contains safeguards relating to persons who are being detained on criminal charges. Under the code, all persons held in detention, regardless of whether they are Egyptian citizens, enjoy the same safeguards available under the law. Every person who is arrested or held in precautionary detention must be informed immediately of the reasons for his arrest or detention in a language that he understands. He has the right to communicate with anyone he chooses and is entitled to avail himself of the services of a lawyer (Code of Criminal Procedure, Article 139). Egypt has voted on a series of constitutions since the 2011 overthrow of President Hosni Mubarak. The most recent constitutional referendum took place in January 2014. The 2014 Constitution provides several guarantees that can be relevant to the situation of detained non-citizens, including the right to challenge detention (Article 54), the right to be protected from torture and abuse (Article 55), and the provision of judicial oversight over all places of detention (Article 56). Non-citizens who are charged with crimes stemming from their immigration status are to be considered innocent until proven guilty in a fair court of law (Article 96). 2.8 Detaining authorities and institutions. Under the 2010 Presidential Decree 204, which defines the borders of the Arab Republic of Egypt, the Egyptian police have the power to arrest and detain individuals for immigration-related reasons. At border points and in military zones such as the Sinai Peninsula, the army may also apprehend individuals for unauthorised entry, as the military is responsible for guarding the borders of southern and western Egypt. The Presidential Decree on Security of the Eastern Border of Arab Republic of Egypt (1995) prohibits the movement of persons within one hundred and fifty meters of the eastern border (with Israel), between Rafah in the north and Taba in the south—apart from Rafah city and other locations permitted by law or the military (Article 1). The military has the authority to sentence anyone who violates this law with imprisonment for at least six months (Articles 2 and 5). The Interior Ministry, which is responsible for the administration of prisons in Egypt, has custody over immigration detainees held in police stations and prisons. It also has the authority to deport non-citizens and to order their temporary detention until deportation is possible (Law of Entry and Residence, Article 27). Since the Egyptian military's assistance in removing President Mubarak in January-February 2011, following weeks of anti-government protests, and the popular military coup of Abdel Fattah al-Sisi against Muhammed Morsi in July 2013, the jurisdiction of the military has been greatly expanded. This has empowered the military to arrest non-citizens in areas outside military zones and to refer cases to military tribunals. In January 2013 the Shura Council, Egypt’s partially elected upper house, passed a law giving military officers the right to arrest civilians and to bring them before military courts. At least four Egyptian military tribunals try persons detained for crossing borders: Aswan and Hurghada (for irregular entries from Sudan); Marsa Matrouh (to and from Libya); and Ismailia (those entering the Sinai military zone). The process can be very unclear to non-citizens—some detainees taken to the military court in Ismailia and then returned to police stations in the Sinai were unable to say whether they had been convicted of any offences and given prison sentences. 2.9 Non-custodial measures. According to Article 30 of the Law of Entry and Residence, when a deportation decision is difficult to enforce, the director of the Department of Passports, Immigration and Nationality can order a non-citizen to reside at a specific place and periodically report to a police station until deported (Article 30). 2.10 Domestic monitoring. Aside from UNHCR implementing partners (see “International Monitoring” below), local NGOs do not have access to detention facilities either in the north coast region or elsewhere. In 2013, a group of activists, doctors, and lawyers formed the Refugee Solidarity Movement (RSM) to assist the large numbers detained along the north coast. The RSM visited detention facilities and, in tandem with local NGOs, monitored and documented statistics related to detentions, deportations as well as humanitarian needs within detention facilities. The RSM is now largely inactive. 2.11 International monitoring. There is a marked difference—in terms of access and monitoring—between police stations on the north coast, and police stations (and other types of facilities) around the country. Since irregular flows expanded on the north coast between 2011-2013, UNHCR, UNHCR implementing partners, and other actors have provided services inside immigration detention facilities on the north coast—Caritas Egypt can provide food and other supplies (e.g. blankets), PSTIC can provide psycho-social support, IOM can provide services related to its Assisted Voluntary Return programme, and Médecins Sans Frontières/Doctors Without Borders (MSF) can provide medical assistance. Elsewhere, monitoring conditions are often remarkably different. In the south, where irregular crossings from Sudan still occur, “access is not as well-established as it is on the north coast, however it’s not impossible.” UNHCR maintains limited access to foreign male and female sections of Al-Qanater Prison in the Nile Delta (historically one of the main facilities used to detain non-citizens prior to deportations) and inconsistent access to a so-called transfer facility in Marsa Matrouh. A source similarly told GDP that, in contrast to the police stations on the north coast, lawyers have previously been able to visit police stations in the Greater Cairo area (for example) to verify that an individual was detained—but without actually being granted access inside the facility itself. Egypt has a poor record of collaborating with UN human rights mechanisms. Although a state party to many international human rights treaties, Egypt is more than a decade late in complying with its reporting obligations to monitoring bodies, including the Committee against Torture and the Human Rights Committee. In 2017, the GDP made a submission to the Committee on Migrant Workers (CMW) ahead of its examination of implementation of the Convention on the protection of migrant workers by Egypt. 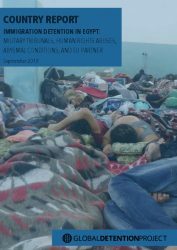 The CMW asked Egypt in 2017 to provide information on immigration detention in its forthcoming report to the Committee including on arbitrary detention, procedural safeguards, conditions of detention, statistical data and alternatives to detention of children. The UN Special Rapporteur on Torture and the UN Working Group on Arbitrary Detention have repeatedly asked for an invitation to visit Egypt for twenty years. 2.12 Criminalisation. Under Presidential Decree Security of the Eastern Border of Arab Republic of Egypt (1995), anyone convicted of entering or exiting the country illegally through the eastern border can face imprisonment and a fine of up to 5,000 EGP (approximately 280 USD) (Article 2). Article 3 of the Law of Entry and Residence prohibits migrants from entering and exiting the country at any points other than those designated as official border crossing points. Article 2 of this law prohibits entry and exit without a valid legal document/passport. Foreign nationals who violate Articles 2 and 3 can face a criminal trial and/or penalties that include: imprisonment for up to six months and/or a fine of up to 1,000 EGP (approximately 56 USD) and are subject to criminal trial where execution of the penalty can be deportation from the country (Article 41). These penalties are also applied to asylum seekers, despite the protections against such measures provided in the 1951 Refugee Convention, to which Egypt is a signatory. Non-citizens who violate the terms of an order of deportation or banishment, fail to reside at a designated residence, or provide false statements or knowingly submit false documentation to Egyptian authorities can be sentenced with up to two years' imprisonment and/or fined up to 2,000 EGP (approximately 112 USD) (Law of Entry and Residence, Articles 38, 40). Penalties are more severe for foreign nationals who (a) are citizens of a country in a state of war with Egypt; or (b) entered Egypt at the border areas listed by decree of the minister of interior, in agreement with the minister of foreign affairs (Law of Entry and Residence, Article 41). In practice, however, criminal sanctions are not systematically applied. According to one source interviewed by the GDP, in the past those arrested for illegal entry to/exit from the country have generally received a suspended sentence—a sentence issued by a judge which will not be enforced if the defendant meets certain conditions—exempting the migrant from serving the sentence. In most cases, judges referred these cases to the Passports and Immigration Department, which reviewed the status of the foreign national and determined whether they should be released, deported, or remain in detention. However, administrative detention has since become the norm in Egypt. There is also little information available that accurately documents the nature of the decision-making process for placing refugees, asylum seekers, and migrants in detention. Activists in Egypt who work with detainees previously reported to the Global Detention Project that decisions related to release or length of time spent in prison are distinctly arbitrary, particularly in the case of Syrians. One source stated that after being arrested and detained for unauthorised entry in Egypt, entire groups of Syrians have been “kept in detention for months, others released, [and] others pushed to leave the country with no apparent consistency with regard to the decision taken by authorities.” While multiple sources have stated that in general, registered refugees and/or asylum seekers will be released after approximately two weeks inside detention, non-registered detainees, however, who may well include persons in need of international protection transiting through Egypt without UNHCR documentation, remain vulnerable to extended periods of administrative detention as well as forcible removals from Egyptian territory. In terms of Syrians who irregularly enter Egypt, if they are a family or have family links in Egypt their chances of release are significantly higher, but single men/women are usually pushed out back to Sudan. In 2016, Egypt passed a counter-smuggling law drawn up through cooperation and consultation with UNHCR and the IOM, and drafted by the country's inter-ministerial National Coordinating Committee for Combatting and Preventing Illegal Immigration (NCCPIM) that was established in 2014 with the express aim of passing new immigration-related legislation. The law is in line with the Palermo Protocols which aim to criminalise smugglers without criminalising irregular migrants. In practice, however, this appears not to be the case. Refugees, asylum seekers, and migrants can still legally be criminalised for illegal entry, stay, or exit as is proscribed in existing legislation—although in practice this appears not to be the case as refugees, asylum seekers, and migrants are still penalised through indefinite administrative detention and deportation. The 2016 law also appears to have had little impact on deportations. In fact, sources say, deportations are becoming more fast-tracked (without extended periods of administrative detention prior to removal)—particularly for Sudanese asylum seekers and migrants—since the passing of the law. 2.13 Externalisation, readmission, and third-country agreements. The EU, EU member states, and various international actors have engaged with Egypt on migration for several years, although “migration management" cooperation has intensified significantly since 2015. Such cooperation with Egypt remains controversial, and has been criticised by rights groups and European policymakers because of the wider human rights landscape in Egypt as well as the perceived risks to refugees, asylum seekers, and migrants themselves.Reporting suggests that Egypt has become a "dead-end" for migrants as a result of cooperation with the EU since 2015. The EU-Egypt Association Agreement came into force in 2004, creating a “free-trade area between the EU and Egypt by removing tariffs on industrial products and making agricultural products easier to trade," but also guiding various aspects of the bilateral relationship. The EU-Egypt Action Plan under the European Neighbourhood Policy (ENP) adopted in 2007 covers cooperation on political, security, economic, trade, investment, scientific, technological, and cultural relations. Within the framework of the ENP, it includes a section entitled “border management” and purports to strengthen co-operation on migration-related issues, including the effective joint management of migration flows, legal and illegal migration, and readmission. Under the section on human rights the plan foresees EU assistance to implement relevant UN recommendations and the recommendations of the Egyptian National Council for Human Rights pertaining to security, detention conditions, and prison staff as well as the protection of the human rights and integrity of detainees and the fight against impunity. In 2012, the EU reiterated its offer to negotiate with Egypt the establishment of a Mobility Partnership in line with similar agreements negotiated with other Mediterranean countries, including Morocco. However, Egyptian authorities rejected the offer. In 2007, Italy and Egypt concluded a readmission agreement under which Italy has sent back irregular migrants—including many Egyptians—without any asylum screening. Later, In 2009, Italy and Egypt concluded a memorandum of understanding designed to "contain irregular migration." In recent years, particularly since irregular flows from Egypt's Mediterranean coastline towards Europe expanded, Egypt has taken a more proactive role in seeking-out agreements, cooperation, and support in its handling of irregular migration as a host and transit country for large numbers of refugees, asylum seekers, and migrants. In March 2014, the Egyptian government formed NCCPIM, an inter-ministerial committee designed to lead on migration policy. Since its foundation, the NCCPIM has been tasked with drafting a counter-smuggling legislation (ultimately passed in 2016) and conducting fieldwork studies on economic migration of Egyptian nationals. Today, it effectively operates as front-of-house for the Egyptian government's dealings with the EU and other actors on migration. The NCCPIM also works alongside the IOM and other international agencies to produce awareness-raising material, principally aimed at Egyptian nationals in Egypt to dissuade them from attempting irregular crossings in the Mediterranean. Cooperation between Egypt and the EU (and EU member states) has intensified since 2015. Egypt has positioned itself as a key EU partner, taking a leading role in multilateral mechanisms including the Khartoum Process and 2015 Valetta Summit (Egypt led the African delegation at Valetta) while at the highest levels "pointedly underlining a growing refugee and migrant challenge." President Abdel Fattah al-Sisi discussed Egypt's migration challenges (and know-how) in a speech at Suez Canal University in mid-2016 and then at the G20 in September the same year, and Assistant Foreign Minister Hisham Badr repeated similar talking-points at the European Parliament’s Committee on Foreign Affairs (AFET) in August 2016. After the Rashid tragedy in September 2016, in which more than 200 people lost their lives not far off Egypt's Mediterranean coast, NCCPIM chairman Naela Gabr sent a letter to all MEPs talking-up the NCCPIM as an example of Egypt's commitment to migration. These engagements tended to present the Egyptian government as a willing partner with longstanding experience of hosting large numbers of refugees and asylum seekers. Some suggest that this repeated mention of large numbers of refugees and asylum seekers (often using either outdated or wilfully inaccurate data) reflects a Gaddafi-style ploy by the Egyptian government to seek-out more EU assistance and funding, and one human rights practitioner commented at the time that Egypt was “very much using the number of migrants, flagging it as a threat." The EU has been content to partner with Egypt because of regional as well as domestic Egyptian factors. These were outlined in a joint European External Action Service (EEAS) and European Commission non-paper, undated but leaked towards the end of 2016, that recommended "strengthened bilateral engagement on migration” to avoid "potential future migration.” The document noted that, while it was “important not to exaggerate the risk of a growing flow of migrants directly from Egypt” (particularly compared with Libya), that a “significant increase, though from a low baseline, of irregular movements…from Egypt towards Europe” and deteriorating political and socio-economic conditions in Egypt meant attention needed to be paid to Egypt's north coast. It also recommended a series of possible avenues for further cooperation, some of which went far beyond existing agreements—including greater cooperation with Frontex through the Seahorse Mediterranean Network “to cooperate with the Libyan Coast Guard to exchange information on irregular migration and cross-border crime.” Because this was a non-paper these recommendations were not binding and instead reflected possible policies to be adopted by the EU in the future, as well as indicating the EU's broader interest in engaging more with Egypt on migration policy. Egypt also receives assistance under the EU Regional Trust Fund in Response to the Syrian Crisis, or so-called Madad Fund, that was launched in December 2014 to support Syria's neighbouring countries that are hosting large numbers of Syrian refugees. Other actors continue to engage with Egypt on immigration-related matters. Germany is one of the primary EU member states engaging with Egypt on its own terms, in addition to EU-level cooperation. During a March 2016 visit to Cairo, German Interior Minister Thomas de Maziere referred to Egypt as an "indispensable ally in the fight against international terrorism and…irregular migration,” despite very obvious concerns about Egypt's human rights record. Through parliamentary questions submitted by Germany’s Left Party coalition, the German government revealed that it had conducted a series of training sessions with Egyptian security agencies on airport security, documents, and border control measures. Elsewhere, as well as providing Voluntary Assisted Return to non-citizens detained in Egyptian facilities, the IOM regularly conducts workshops for capacity-building with Egyptian officials and government agencies (sometimes through the EU funding sources mentioned above), while the United Nations Office on Drugs and Crime (UNODC) also conducts similar projects with Egyptian security agencies related to human trafficking. Egypt also coordinates on deportations and returns of refugees, asylum seekers, and migrants. Although in the past Egypt has been heavily criticised for forcibly returning refugees and asylum seekers to places where they may be subjected to persecution and possibly torture, recently Egypt—and particularly Cairo International Airport—has been employed as a transit-point during long-haul deportations. Monitoring of these kinds of returns is difficult because they usually involve a transit country (Egypt) and destination country where international monitoring access to detention sites in airports and other sites tends to be poor—although testimonies do sometimes emerge. In June 2018, U.S. authorities appeared to announce that a 34-year-old Eritrean national being held in transit in Cairo International Airport had taken his own life having been deported by ICE, and then held in the detention room at Cairo International Airport prior to his return to Asmara, Eritrea. Sudanese refugees and asylum seekers being returned from EU states have also been held in transit in Cairo International Airport. Testimonies from asylum seekers previously in Israel also suggest that Cairo International Airport was used in the past as transit during deportations from Tel Aviv to third countries on the African Continent, and Egypt also deported Sudanese asylum seekers following returns from Israel. Despite EU attempts to bolster Egypt's capacity to host and maintain displaced/migrant communities on its territory, there are still valid concerns about rights protections for those same communities. Some observers suggest that the Egyptian government intermittently enacts policies with the aim of making life in Egypt difficult or unattractive to refugees, asylum seekers, and migrants. One senior IOM representative previously commented that it is unlikely Egypt “has an interest to keep migrants or refugees before they make their way to Europe [sic],” referring to reported EU plans to introduce reception centres in North African countries, and that Egypt may ultimately “encourage [non-citizens] to leave one way or the other.” Recent policy changes including an up-tick in arbitrary detentions of non-citizens by Egyptian police, and anecdotal reports of planned closures of all education facilities for refugees and asylum seekers (run by civil society groups and NGOs), can also be understood in that vein. Most recently, in September 2018, European officials (including Donald Tusk and Austrian Chancellor Sebastian Kurz) met with Egyptian counterparts in Cairo and then—later in the month—in New York. Migration was at the forefront of both meetings. Austrian Chancellor Sebastian Kurz recently stated that Europe had "to ensure that as few people as possible leave northern African countries for Europe," and that, "If they do, the situation should be dealt with as close to the African coast as possible." For years, EU policymakers have discussed the idea of creating reception centres in North African countries where—supposedly—asylum seekers could be processed and then granted legal entry to EU countries afterwards, although practically this is likely an attempt to externalise European borders as well as the responsibility for hosting displaced and migrant populations. This idea is not new, and until now no North African country has expressed an interest in hosting such centres. 3.1 Summary. Egypt does not operate dedicated facilities for immigration-related detention nor does there appear to be an official list of detention sites for this purpose. Decree 659, from the year 1986, stipulated that the following prisons should be used for the temporary custody of foreigners awaiting deportation: Qanater El-Khayereya Men’s Prison, the Qanater El-Khayereya Women’s Prison, the Alexandria Prison, the Port Said Prison, and Torah Prison. These are all important prisons in Egypt for incarcerating convicted criminals. In the absence of an official list of facilities to be used for immigration detention purposes, authorities make widespread use of prisons, police stations, and military camps. Numerous observers have documented detention cases at these facilities in recent years. Non-citizens are commonly held alongside criminal detainees inside prisons. 3.2 Detention facilities. According to a previous estimate made by the Global Detention Project (in 2014), at least 58 facilities were used during the period 2011-2014 years for immigration-related reasons—mainly police stations in Cairo, the Nile Delta, and northern coastal regions, as well as two prisons in the environs of Cairo. Among the facilities reported in 2014 were: Torah Prison, Cairo; Al-Qanater Prisons, Qalyubiya Governorate; Aswan City Police Station; Nasr El Nuba police station; the Aswan Central Security Camp in Shalal; Ismailia Prison and Ismailia Police Station; Qena Police Station; Hadra Prison, Alexandria; Kom Ombo Police Station; Edfu Police Station; Hurghada Police Station; Marsa Alam Police Station; Daraw Police Station; Gourna Police Station in Gourna/Luxor; Ras Gharib Police Station on the beach of the Suez Gulf; the Romana Police Station; Bir El-Abd Police Station; El-Khoseyma, El-Nakhl Police Station and Hassana Police Station; four police stations in Arish, North Sinai; Ataqa Police Station in Suez; Dahab Police Station; Nuweiba Police Station (Sinai); Rafah Police Station (Sinai); Ras Sidr Police Station (Sinai); Taba Police Station (Sinai); Tur Sina Police Station (El-Tor), Sinai; Galaa Prison; and the El-Mostaqbal Police Station. In the Nile Delta region, facilities that have been used since 2011, and which became more important sites of immigration detention after increasing irregular departures by Syrian refugees and Palestinian refugees from Syria after mid-2013, include: Karmouz Police Station, Montazah 2 Police Station, Bab Sharq Police Station, Raml 1 Police Station, Borg El Arab Police Station, Amreya Police Station, Dekheila Police Station, Anfoushy Police Station, Matrouh Police Station, Idku Police Station, Rashid Police Station, Rahmaniya Police Station, Shabrakeet Police Station, Brembel Police Station, Biyala Police Station, Hemma Police Station, Zaafaran Police Station, Baltim/Burullus Police Station, Gamasa Police Station, Port Said Police Station, and Damietta Police Station. Among the police stations in Alexandria most commonly used to detain non-citizens are Karmouz and Muntazah 2, in part because of their larger size compared with some of the smaller facilities on the outskirts of the city. More recently, a source in Egypt provided the following list of detention facilities in Greater Cairo that have been used since 2017 but which have not been previously documented by the GDP: Nasr City 1st Police Station, Nasr City 2nd Police Station, Dar El Salam Police Station, Dokki Police Station, Agouza Police Station, Masr El Gedida 1st Police Station, Sheikh Zayed Police Station, 6th October 1st Police Station, 6th October 2nd Police Station, 6th October 3rd Police Station, New Cairo 1st Police Station, Shorouk Police Station, Ain Shams Police Station, Qasr Nile Police Station, Faisal Police Station, Al Ahram Police Station, Boula’ Police Station, Al Rehab Police Station, Gamaleya Police Station, Barageel Police Station, Moqattam Police Station, Zeitoun Police Station, Al Saff Police Station, Abdeen Police Station, and Al Amireya Police Station (Giza). Outside of the Greater Cairo region, the following facilities have also been reported as used for immigration purposes recently: Abu Simbel Police Station (Aswan), Safaga Police Station (Red Sea Governorate), Al Quseir Police Station (Red Sea Governorate), Shalateen Police Station (south-eastern border with Sudan), and Al Salloum Police Station (north-west Egypt on the Egypt-Libya border). The use of facilities can vary considerably over time, depending on changing irregular flows and the responses of authorities. For example, facilities are generally now used less in the Sinai Peninsula because irregular flows towards Israel have decreased since 2013 as result of control polices of both Israel and Egypt, and an anecdotal awareness of these measures among displaced communities within Egypt. In some cases, officials commandeer non-security-related facilities for specific periods to respond to immediate demands. In late 2014, for example, authorities in Alexandria commandeered a youth centre in the west of the city, the Anfoushy Youth Centre, to accommodate people apprehended at sea or on the coast while attempting to leave Egypt in smuggling vessels towards Europe. This facility, which the Global Detention Project categorised as an Ad Hoc detention site, held approximately 130 people in early October 2014 who had been arrested on Egyptian shores in recent weeks. One journalist reported that the detainees were denied access to lawyers while held at the youth centre. The centre was closed some months later, reportedly due to disagreements between the governor of Alexandria and the Ministry for Youth and Sports (who owned the centre). Immigration detainees in Anfoushy were then distributed to several police stations elsewhere in the city, including Karmouz Police Station. 3.3 Conditions of detention. According to accounts provided by migrants and refugees who have spent time in detention in Egypt, as well as observers with first-hand knowledge of detention dynamics, anywhere between 20-60 people typically share cells in Egyptian prisons. The cells are generally between 16-30 square meters and provide access to a single toilet and washing/drinking facility. Detainees receive one meal a day. A blanket is provided to each prisoner—their only bedding—and each detainee sleeps on the floor. Treatment of detainees varies greatly depending on the particular prison. Conditions can vary widely from facility to facility—on the north coast, sometimes a police station may have an open area or courtyard that detainees are free to use and move around in, whereas other facilities are notorious for being cramped and poorly served. In police stations, detainees are generally not allowed to leave their cells and are locked up 24 hours a day—although there are some notable exceptions, including Alexandria's Karmouz Police Station, where detainees are given access to open-air spaces for a set time each day or week. Cells in police stations can be as small as three or four square metres and are meant to hold a few people at a time for short periods. There is no budget for food or healthcare for larger groups of detainees held for weeks or months. 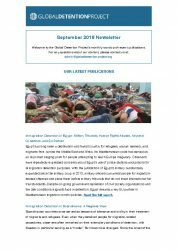 In late 2013, a coalition of Egyptian NGOs documented the situation of several hundred Syrian refugees arrested and arbitrarily detained in Alexandria from August to October 2013. They were held in crowded detention facilities that lacked minimum health standards. Some facilities had insect infestations that led to skin diseases as well as respiratory and gastrointestinal illnesses among detainees. In May 2011, a seriously ill Eritrean male detainee died in El-Mostaqbal police station in Ismailia. He never received medical treatment and was not transferred to hospital. Another Eritrean reportedly died in the Taba police when he failed to receive treatment for tuberculosis. While the segregation of males and females is generally respected in Egyptian prisons, children are reportedly detained alongside adults. However, minors are generally held with their mothers and unaccompanied children are generally detained with women. Administrative detainees—including refugees, asylum seekers, and irregular migrants—are frequently detained alongside criminal detainees. While foreign nationals are frequently held alongside Egyptian citizens in police stations, they are, where space permits, detained separately from Egyptian citizens in prisons. Undisclosed source, Email communication between representative of a non-governmental organisation and Michael Flynn (Global Detention Project), 7 October 2014. Amnesty International, "'We Cannot Live Here Anymore': Refugees from Syria in Egypt,” 17 October 2013, https://www.amnestyusa.org/wp-content/uploads/2017/04/mde120602013en.pdf; P. Beaumont and P. Kingsley, “Devil and the Deep Blue Sea: How Mediterranean Migrant Disaster Unfolded,” The Guardian, 1 October 2014, https://www.theguardian.com/world/2014/oct/01/-sp-sea-mediterranean-migrant-disaster; T. Rollins, “Egyptian Army Shoot Dead Syrian Migrant, Wound Palestinian – Eyewitnesses,” Beacon Reader, 4 October 2014. Amnesty International, “Egypt: Deadly Journeys Through the Desert,” MDE12/015/2008, August 2008, https://www.amnesty.org/en/documents/MDE12/015/2008/en/, p.4; Human Rights Watch (HRW), "World Report 2010: Events of 2009,” 20 January 2010, https://www.hrw.org/report/2010/01/20/world-report-2010/events-2009, p.494; Undisclosed source, Communication between representative of a non-governmental organisation and the Global Detention Project, 21 March 2011. Undisclosed source, "Global Detention Project Questionnaire,” Global Detention Project, 2011. Undisclosed UNHCR source, Conversation with Tom Rollins (Global Detention Project), Cairo, Egypt, 21 January 2018. T. Rollins, “Egypt Deports Palestinian Syrians Back to Conflict Zones," Al-Monitor, 25 August 2014. Undisclosed source, Email communication between representative of a non-governmental organisation and Cecilia Cannon (Global Detention Project), 10 March 2011. Undisclosed source, Communication between a representative of a non-governmental organisation and the Global Detention Project, 6 March 2011. Undisclosed source, Email communication with Tom Rollins (Global Detention Project), 17 August 2018. Undisclosed source, Skype conversation with Tom Rollins (Global Detention Project), 18 September 2018. Undisclosed source, Email correspondence with Tom Rollins (Global Detention Project), 27 September 2018. Sudan Tribune, "UN Probes Deportation by Egypt of Sudanese Expelled from Israel,” 31 October 2007, https://sudantribune.com/spip.php?iframe&page=imprimable&id_article=24526; Undisclosed source, Interview with Sudanese refugee in Cairo, Egypt, 20 January 2018. Undisclosed source, Interview with Tom Rollins (Global Detention Project) in Cairo, Egypt on 21 January 2018. Undisclosed source, Email communication between representative of a non-governmental organisation and Michael Flynn (Global Detention Project), 12 October 2014. 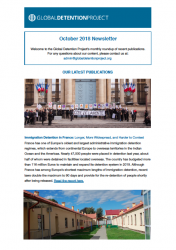 Undisclosed Source, Email communication with Michael Flynn (Global Detention Project), 28 September 2018. T. Rollins, “Egyptian Army Shoot Dead Syrian Migrant, Wound Palestinian – Eyewitnesses,” Beacon Reader, 4 October 2014. Tom Rollins (Global Detention Project), personal observations from reporting in Egypt between 2013-2015. Undisclosed Source, Information provided to Global Detention Project from a representative of a non-governmental organisation, 3 October 2010; Undisclosed Source, “Global Detention Project Questionnaire,” Global Detention Project, 2011. M. Nowak, “Report of the Special Rapporteur on Torture and Other Cruel, Inhuman or Degrading Treatment or Punishment,” United Nations Human Rights Council, A/HRC/13/39/Add.1., 25 February 2010. Undisclosed Source, Information provided to the Global Detention Project from a representative of a non-governmental organisation, 6 March 2011. Unnamed Egyptian NGO (GDP Partner), Personal Observation based on Client Interviews, 20 August 2018. Deport the African refugees to Egypt? Not so fast. +972 Blog. 31October 2012. Law on Entry and Residence of Aliens in the Territories of the United Arab Republic and their Departure Therefrom. 1960. (Law of Entry and Residence). Article 3. Law on Entry and Residence of Aliens in the Territories of the United Arab Republic and their Departure Therefrom. 1960. (Law of Entry and Residence). Article 2. Law on Entry and Residence of Aliens in the Territories of the United Arab Republic and their Departure Therefrom. 1960. (Law of Entry and Residence). Article 31 bis. Law on Entry and Residence of Aliens in the Territories of the United Arab Republic and their Departure Therefrom. 1960. (Law of Entry and Residence). Article 16. Law on Entry and Residence of Aliens in the Territories of the United Arab Republic and their Departure Therefrom. 1960. (Law of Entry and Residence). Article 27. Unnamed Egyptian NGO (GDP Partner), Personal Observation. Law on Entry and Residence of Aliens in the Territories of the United Arab Republic and their Departure Therefrom. 1960. (Law of Entry and Residence). Article 31. Undisclosed source. Email communication between representative of a non-governmental organization and Michael Flynn. (Global Detention Project). 12 October 2014. (Source asked to remain anonymous). Email communication between representative of a non-governmental organization and Michael Flynn. (Global Detention Project). 7 October 2014. (Source asked to remain anonymous). Undisclosed source. 2011b. Email communication between representative of a non governmental organization and Cecilia Cannon (Global Detention Project). 10 March 2011. (Source asked to remain anonymous). Undisclosed source. 2011. “Global Detention Questionnaire”. Global Detention Project. June 2011. Geneva, Switzerland. Undisclosed source. 2011. “Global Detention Questionnaire”. Global Detention Project. 2011. Geneva, Switzerland. This past summer, people across the globe watched in outrage as children were forcibly separated from their parents at the U.S.-Mexico border and placed in hastily set up camps and cages. 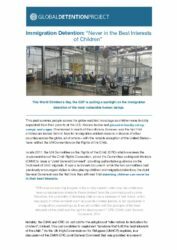 Overlooked in much of the criticism, however, was the fact that children are locked behind bars for immigration-related reasons in dozens of other counties across the globe, all of whom—with the notable exception of the United States—have ratified the UN Convention on the Rights of the Child.